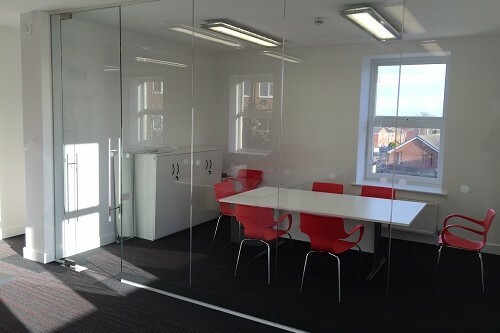 If you are looking for the latest modern or contemporary styling for your work space, then our frameless glass partitions systems are the obvious choice. 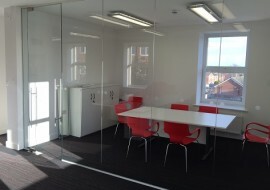 With a choice of curved, straight, single and double glazed options, this system can be designed to produce a unique office space to suit client’s requirements. 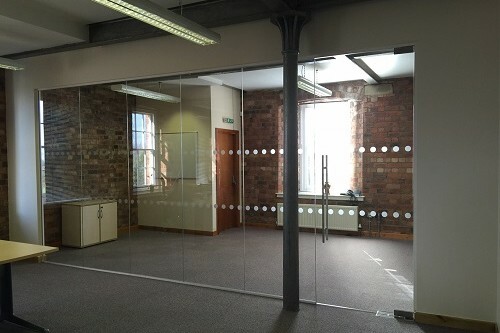 Using a minimum number of aluminium framing sections, this partitions system provides an office divide that allows unhindered vision whilst maintaining the privacy of individual offices. 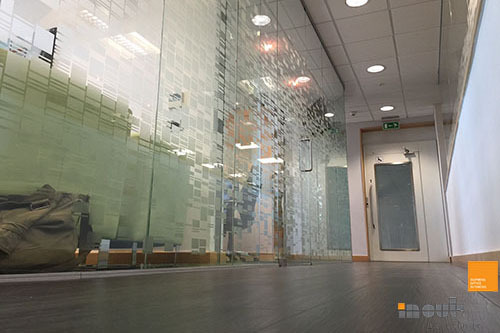 A fully integrated frameless glass partitions system with no frame to break up the finish with acoustic performance and fire resistance, can be fitted with timber or glass doors. 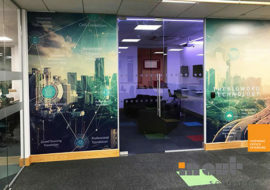 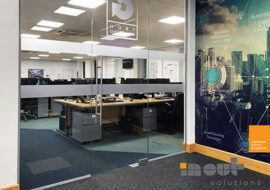 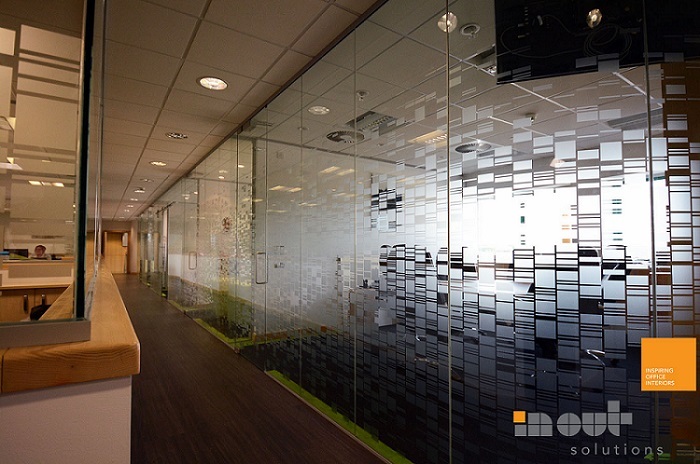 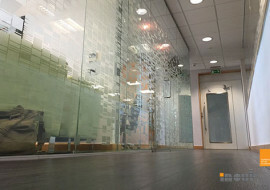 With 10, 12 or 15mm toughened glass, depending on the height of the partition; the glass can be tinted if required, and jointed using silicone or a dry joint system. 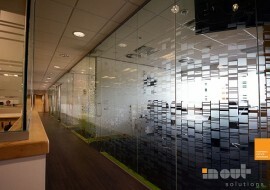 Any vinyl, manifestation can be applied to the glass. 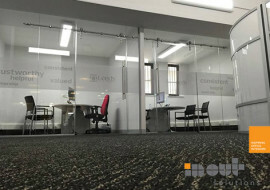 These can be used to simply highlight the presence of the partitions, create individual designs or incorporate logos. 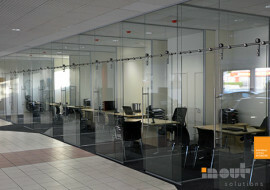 Single modules – up to 38dB. 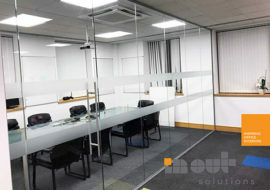 Double modules – up to 47dB. 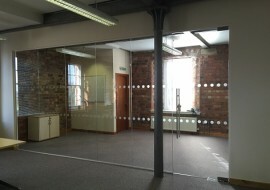 For more information or advice on frameless glass partitions system’s performance, please contact In Out Solutions.